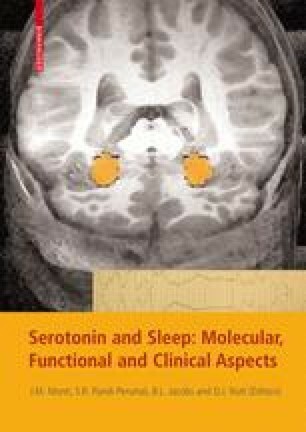 Serotonergic neurons located in the dorsal and median raphe nuclei innervate the whole neuraxis and are critically involved in a large number of physiological functions, including sleep. Derangements of the serotonergic system are suspected in several psychiatric disorders, including mood and anxiety disorders. A large body of data supports a prominent role of dopamine in cortical function. However, much less is known on the role of serotonin (5-HT) in the neocortex, despite a very dense serotonergic innervation of some areas, such as the frontal lobe. Among other 5-HT receptors, this area contains a high density of 5-HT1A and 5-HT2A receptors in the rodent, primate and human brains. Using double in situ hybridization, we reported on the presence of both receptor subtypes in a high proportion of pyramidal neurons and a smaller, yet significant proportion of GABAergic neurons. These data indicate that 5-HT can modulate the activity of cortical networks in a number of ways, including the activation of receptors on projection pyramidal neurons and on local inhibitory interneurons.